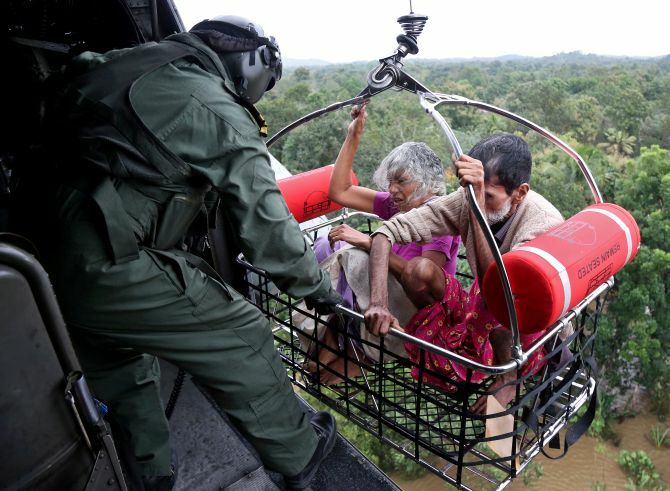 The Indian Navy rescued nearly 17,000 people caught in gushing waters in flood-ravaged Kerala, a Defence spokesperson said in Kochi on Monday. Navy personnel who were part of the rescue mission code named 'Op Madad' in Kerala, displayed their skills and courage in rescuing thousands of people, Commander Sridhar Warrier, the spokesperson in Kochi, said. "Such was their efficiency that in fact, no deaths by drowning were reported in any area where Naval teams systematically organised their rescue efforts," he said. Commander Warrier said a robust and efficient Command, Control and Logistics Organisation of the Southern Naval Command, coordinated by Joint Operation Centre, ensured naval personnel deployed in the worst-hit areas were utilised efficiently to rescue maximum number of people. "Once the resources available with the Southern Naval Command in terms of Gemini boats and divers were found to be falling short, additional resources were sought and promptly received from other Naval commands," Commander Warrier said. Consequently, on August 9 in view of the worsening situation and the challenges faced by the state administration, the Southern Naval Command launched 'Operation Madad' to facilitate rescue and relief efforts to the affected areas, the spokesman said. "This resulted in major flooding at Ernakulam, Kottayam and Pathanamthitta districts mainly due to opening of shutters of four dams in Idukki district and Kakki Dam in Pathanamthitta district and led to massive increase in water levels and flow in Periyar and Pamba rivers," he said.